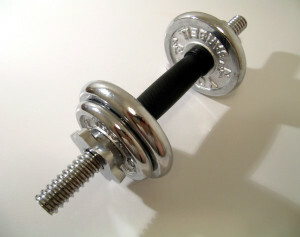 Most women try to steer clear of the weights in their local gym out of fear of developing “man arms” or bulging biceps. However the truth of the matter is weight training, when done correctly and in moderation, can yield many benefits for its female users. Below we have listed four of greatest benefits of weight training for women. 1. Lose the fat, keep the muscle. If you’re trying to shed a few pounds then aerobic exercise can get the job done, however if you’re trying to shed more than just a “few pounds” then adding a little weight training to your exercise routine is the best way to go. Studies show that on average weight lifting helps users lose 40% more body fat than aerobic exercise. In addition, lifting weights adds to your weight loss efforts by helping you to lose pure fat rather than both fat and muscle. Aerobic exercise, on the other hand, often results in the loss of both fat and muscle. In fact, nearly one-fourth of weight loss attributed to aerobic exercise is the loss of muscle. 2. Increase your metabolism and burn more calories. Who wishes that they could burn calories by doing absolutely nothing? Well you can—kind of. Research shows that women who engage in total-body weight lifting exercise regimens experience calorie burning at a high rate, even days after their workout. This is because the muscles are still working to help your body rejuvenate after a workout. So this is why people who weight train are able to burn calories even by just lounging around on their “rest days”. 3. Strengthen weak bones. Because women have a higher risk of developing osteoporosis as they age, maintaining strong bones is essential. As people get older, the mass in their bones begins to decrease (this is especially true for women). A large reduction in bone mass often tends to increase one’s chances of sustaining a fracture or another bone injury. Weight training helps to increase bone density which helps to build stronger bones and ultimately helps to prevent bone injuries. 4. Reduce your risk of a stroke or heart attack. Having a healthy heart is at the core of having a healthy life. Proper weight training has been proven to improve heart health through the lowering of diastolic blood pressure. In turn, low diastolic blood pressure levels are the key to reducing one’s risk of having a stroke or heart attack. Studies show that the risk of having a stroke is reduced by up to 40%, while the risk of having a heart attack is often reduced by up to 15%. While weight training does have several benefits, it is important to remember than moderation is essential, not only for women but for any individual who participates in weight training exercises. Here at RPI Therapy Services we suggest that a “crawl before you walk” mentality is applied in regards to beginners of weight training. This means being careful not to over-do it by doing low reps and implementing plenty of rest periods during your workout. Moreover, we do not recommend weight training for individuals with severe injuries or disabilities. For more information on weight training as it relates to physical therapy, contact one of our locations here. If you are looking for a physical therapist in St. Louis and are interested in seeing what services we offer, visit our website at http://www.rpistl.com/.